On Sunday, August 20th at Earth Haven Learning Centre, Jonathan Code took us on a personal journey into the heart of yarrow – the central ingredient in the biodynamic compost preparation #502. 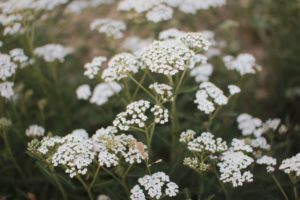 In this empowering and insightful workshop, Jonathan first invited us to perceive the essence of yarrow through the soul-senses of smell and taste. As we breathed in the aroma of yarrow’s essential oil and sipped yarrow tea, each of us was also invited to examine the physical characteristics of the yarrow plant. Jonathan carefully questioned us about our experiences, and we were able to clearly and accurately voice our perceptions. A rich ‘picture’ of the yarrow plant began to emerge. To add to this picture, we also went outdoors and explored the types of environmental conditions in which yarrow thrives. In the afternoon, Jonathan shared a thought-provoking lecture inviting us to phenomenologically examine the components of the yarrow preparation: the yarrow flowers, the stag bladder, the exposure to sunlight, and the time of year of its preparation. We were asked to consider the principles behind each component of this preparation. A discussion occurred as to how the biodynamic compost preparations could be made in other parts of the world where the traditional components are not readily available. Many thanks to all who attended and special thanks to Jonathan Code.